I am very excited about using the Daily Five this year. 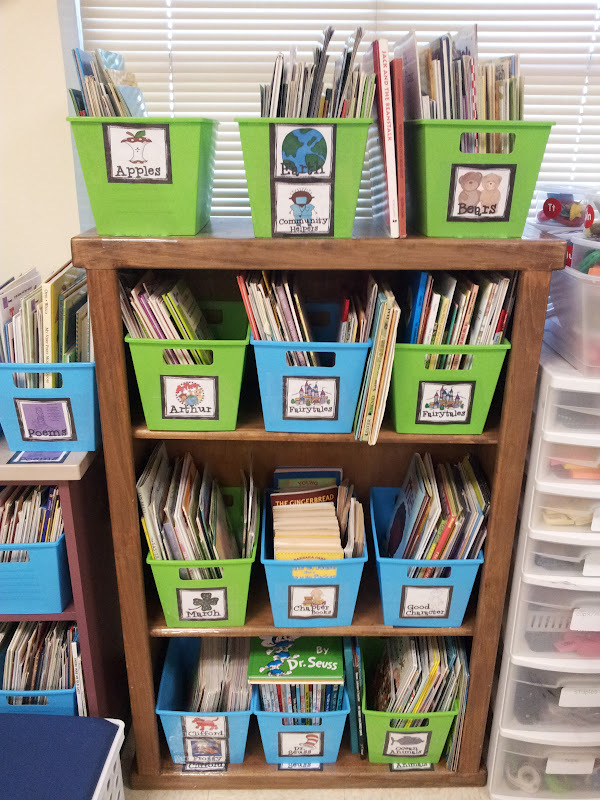 I recently posted about setting up my classroom library to get ready for book shopping. Here are a few of the basics I have taken care of to get ready for implementing the Daily Five in my classroom. 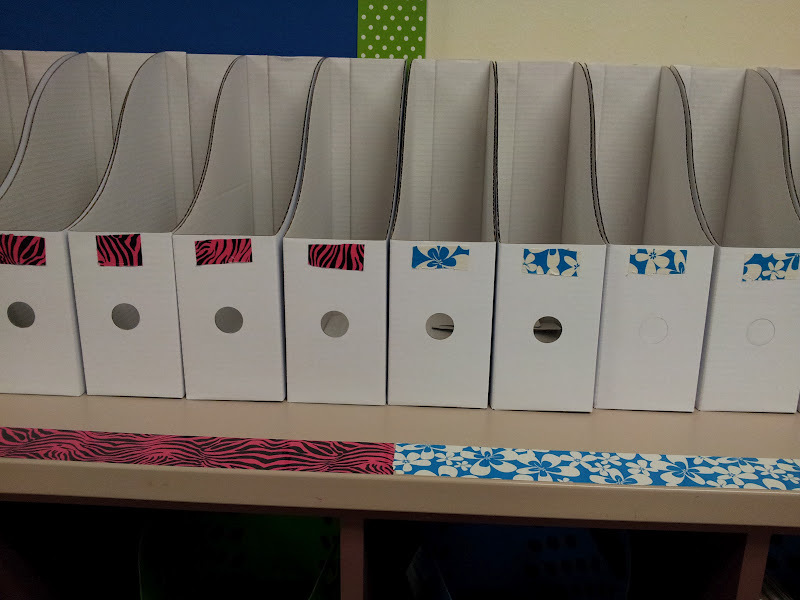 I made book boxes for my students. I bought 25 boxes for $10 at IKEA. I colored coded each box and the counter top with decorative duct tape so it would be easier for my little ones to find and put away their book boxes. Eventually each box will have a child's photograph and name on the front. I put up my CAFE board. Be careful not to skip this part. The CAFE strategies and lessons are very important for growing your students as readers. 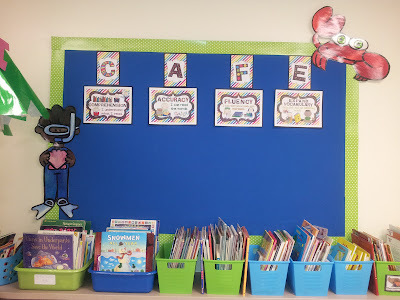 Make sure you refer to the CAFE board often so that your students will begin to use it as a resource. In kindergarten you may want to start by setting group goals rather than individual ones. Once your kindergartners begin to understand and use the strategies on the board you can set individual goals with them. I set up my classroom library. I labeled my buckets, the shelf where the bucket goes, and each book. I want my students to have the opportunity to shop for books so it was important to have an organized system for finding and returning books. I will talk more about shopping for books in an upcoming post. Since my students are going to be spending so much time with books in their hands there are bound to be some book "accidents." 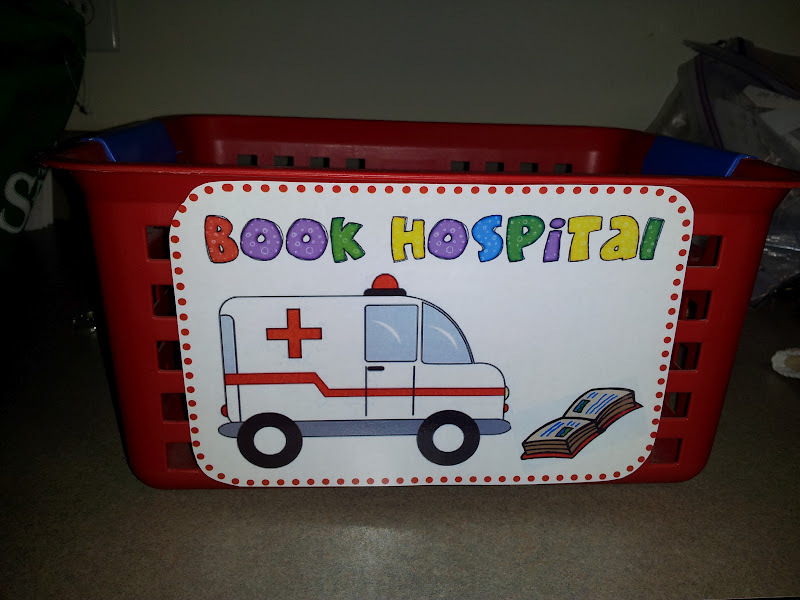 I made a book hospital to promote problem solving independence with this. 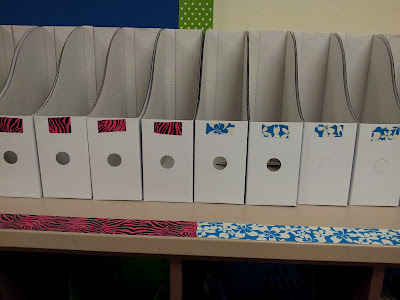 Instead of interrupting me while I am working with a small group, students can simply place their books that are in need of repair in the book hospital. I set up lots of little areas around my room for reading. 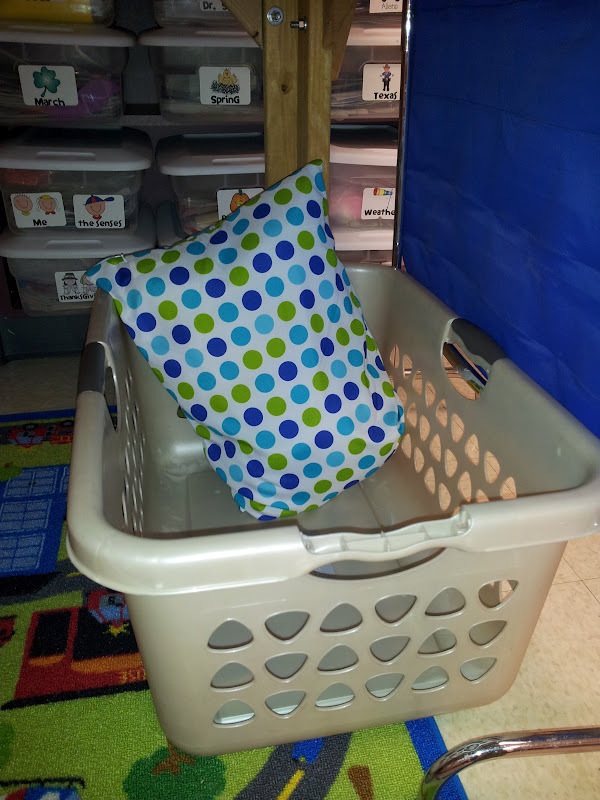 I have special pillows and rugs, small chairs and stools, laundry baskets, my teacher rocking chair, my pirate ship, and a small table and chairs. I purchased all 3 of Kim Adsit's readers workshop units to use for making Daily Five anchor charts and for use during my mini-lessons. I have already printed and cut out the anchor chart pieces so they are ready when I teach the lessons to my students. We will construct the anchor charts together using the pre-printed pieces during the lessons. I have collected all kinds of simple sight word stories and emergent readers for my students to get started with. Since most of my little ones will not be reading words when they first come to me I needed very simple stories to start with. One unit I purchased was Kimberly's (Funky First Grade Fun) Personal Sight Word Stories. Watch for another post coming soon with other great units I found with simple sight word stories and predictable text. Where did you get the pillow that is in your laundry basket? It's so cute and would match my room! 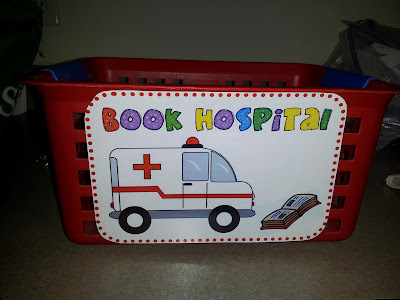 I love your book hospital idea! I'm going to make one for my room. Many of my kinders have barely held a book before and have to learn how to respect them so we have many accidents in the beginning of the year. This would be a great way to stress how we need to respect books!! There are several schools in my district who have gone to using the Daily Five. We have Texas Treasures as our state adopted curriculum but we also have a district curriculum. The two are not aligned in any particular order. We have to follow the district curriculum and we use everything else as a resource. I plan to move along with the Daily Five and my small group focus lessons based on the needs of my students. I will choose the CAFE strategies that I focus on and add each week based on the district curriculum. WOW! Your Kindergarten students are so fortunate to have you! You have made everything developmentally appropriate! SMILES!! I am setting up my kindergarten room for the first time, where did you get those book bins for your kids to shop from, and did they work for you? My book boxes came from IKEA. The blue and green bins came from The Dollar Tree. Hi there! I can across your blog and I am in LOVE with your Readers Respect anchor chart. Would you mind sharing it? Lindsey- Those charts came from Kim Adsit. They are in her reader's workshop units.